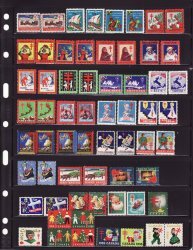 1957-91 Canada Christmas Seal Collection, as required, singles, pairs, blocks, strips, and sheets, full gum, F/VF, MNH. Issued by the Canadian Tuberculosis Association (1957-76), and the Canadian Lung Association (1977-91). 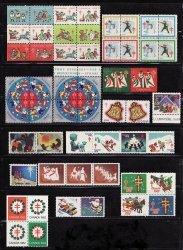 1957-91 Canada Christmas Seals, as required, singles, pairs, blocks, strips, and sheets, full gum, F/VF, MNH. Scan is an example of seal collection contents. Seals in this packet are as follows: single stamps: 1975, 1979; alternating pairs: 1970, 1974, 1977; blocks of 4: 1968, 1978, 1981, 1982; blocks of 8: 1958; block of 12: 1957; block of 20: 1959; block of 40: 1963; strip of 3: 1980; strip of 10: 1960, 1962, 1964, 1965; full sheets: 1961, 1966, 1967, 1969, 1971, 1972, 1973, 1976,; singles & gift tags: 1983, 1984, 1985, 1986, 1987, 1988, 1989, 1990, 1991. 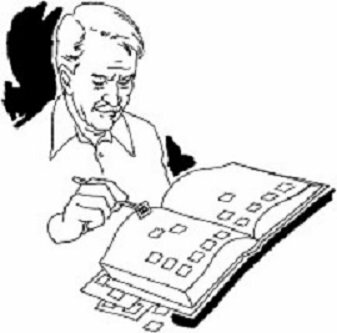 Check the contents of this collection, The collection is not just a representation of the various years. This is as individually described in the Green's Catalog, and required to complete the various albums. Issued by the Canadian Tuberculosis Association (1957-76), and the Canadian Lung Association (1977-91).